Later that day we arrived at Michigan State University in East Lansing, Michigan. The campus is like a little town of their own. They had a flag but it had the campus logo on it. There even was a McDonald’s, with photos of Michigan State basketball players. The trees were fresh and the leaves were green. To me, the buildings on campus were huge. During our trip, we met with Jim Detjen, our guide who is a professor of environmental journalism at the university. Jim has gray hair and wears glasses. He used to work as a newspaper reporter, and I thought he was a nice guy. On Saturday, Jim took us to a place called Pizza House for lunch first, and then he brought us to see different parts of the Michigan State campus, like the 4-H Children’s Garden. At the garden, we saw ponds and flowers, which were dead because it was fall. The garden also had a maze, a bridge and many other features. For example, there was a musical device in the ground. When you stepped on it, it made a sound like chandeliers were hitting each other. But the main point of our trip to Michigan State was to see the journalism facilities on campus. One of the facilities was The State News building, where the newspaper for the campus is created. The paper is independent, and not a branch of the university, said the paper’s student editor-in-chief Kate Jacobson, when she took us on a tour. We also took a tour of a television station on the campus called WKAR, led by Gary Reid, the station manager. Gary explained to us the different programs the station broadcasts. 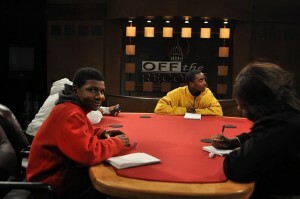 One, a political program, was called “Off The Record.” In the “Off The Record” studio, we pretended to be on the show. Micah, our journalism teacher, was the host, while me and the other students, Tyreshia, Makylia and Carlos, acted like we were journalists from different places, answering questions on television. Some of the WKAR studios were very large. “You can drive a vehicle in and you can bring a stage in,” station manager Gary said of one studio. My trip to Michigan State University persuaded me to go there, because they have good programs. They also have good studying areas and they have the subject I want to study there. The campus has great food and food courts. I also like some of the journalism facilities: the television studio was great. In my opinion, I think you can have fun at Michigan State and learn at the same time. This entry was posted	on Tuesday, December 13th, 2011 at 11:46 pm. You can follow any responses to this entry through the RSS 2.0 feed. You can leave a response, or trackback from your own site.